Two weeks ago, in Beirut, I was speaking on the impact of modern imaging in pulmonary medicine, to a group of chest physicians from Egypt. The moment I started speaking on CT guided lung biopsies, a physician got up and started talking about the dreaded risk of pneumothorax. I have had similar reactions in other towns in India, including tier I cities like Delhi. I explained to him that while a pneumothorax is not uncommon during CT guided biopsies, there are many ways to mitigate its seriousness; single puncture, minimal trauma, bleeding along the tract during withdrawal and arguably puncture side down for a few minutes are measures that reduce the severity and incidence of or prevent the occurrence of pneumothorax. But even if a pneumothorax does occur, it is a slow event that takes its own time to increase, if it does. If a pneumothorax occurs during the procedure, it can be aspirated at the same time and more often than not, that cares of the problem and we can even continue with the procedure (Figure 1). In case the pneumothorax occurs after we have washed out as a delayed complication, then we can still aspirate it using an over the needle catheter. A recent video describing this procedure has been posted on The New England Journal of Medicine site. While this video shows the technique to be used in patients with spontaneous pneumothorax and describes a blind approach, we can use this simple procedure to aspirate under CT guidance as well and then check the status immediately on the CT scan table. 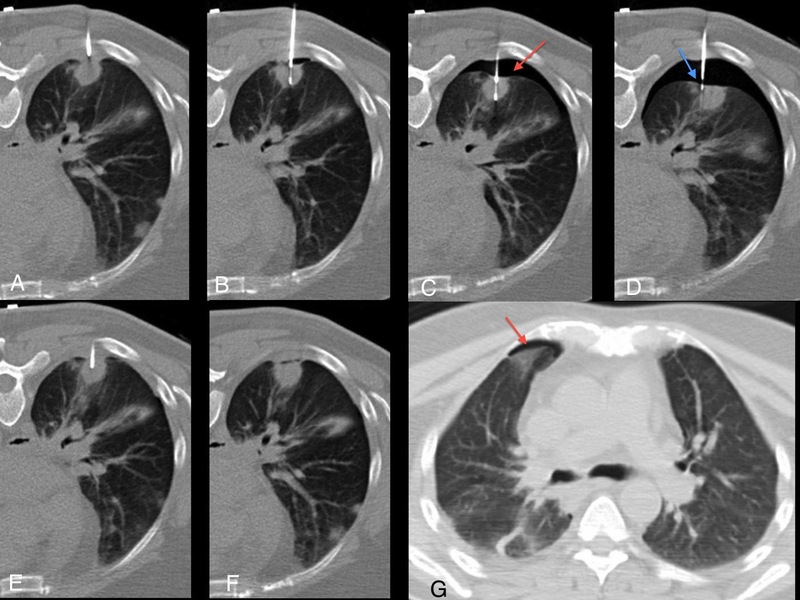 A and B show the start of a CT guided core biopsy of a subpleural nodule using a coaxial system. 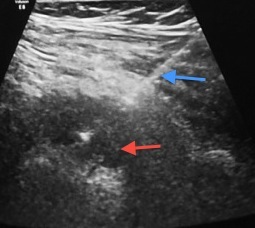 Since the nodule is immediately subpleural, the risk of pneumothorax is slightly higher than for a deeper nodule and C shows the developing pneumothorax. In D, the canula has been withdrawn into the pleural space and the pneumothorax was aspirated. E shows the biopsy continuing after the pneumothorax has been aspirated. It did not recur. 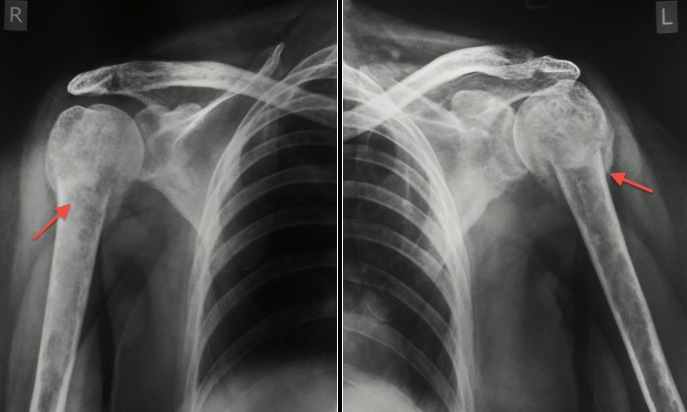 Five minutes after the procedure, a scan in the supine position (G) shows a thin residual pneumothorax that was non-progressive. In the worst case scenario, an interventional radiologist should be able to put a tube in as well, despite the fact that the need to do this would be very low in experienced hands. The Making of a Good Radiologist Today! This week’s New England Journal of Medicine (NEJM) has an article titled “Holistic Review – Shaping the Medical Profession One Applicant at a Time” that describes how some medical colleges in the US are now assessing medicine applicants more holistically than just on their academic grades. This allows the selection of candidates who will have not only the knowledge required to practice medicine, but the ability to communicate better with patients, to work in teams and to deliver better all-round care. A similar article by Dr. Pauline Chen in 2010, in the New York Times, describes what the “right stuff” to be a doctor and also the importance and use of personality tests to predict how students will perform as physicians. Recently, she has written another similar article that discusses a medical student who was very good with her knowledge but had poor communication skills and an inability to get along with her colleagues and peers, but couldn’t be “flunked” for these shortcomings. This also applies to radiologists. If being a radiologist was only about reading images on a workstation or view-boxes without patient interaction, then all that we would require is knowledge and the ability to work fast, accurately and to deliver quick turn-around times. A good radiologist has the ability to deliver results accurately and in a timely manner. Dr. Woodcock in a short article distils this into the three “A”s of Affability, Availability and Accuracy. The Royal College of Radiology has specific guidelines. It also means not shying away from leadership positions in hospitals and practices and actual patient consultations. In the end, as radiologists we must realize that as radiology becomes more and more important to patient management in many disciplines, we have the unique opportunity and ability to be a part of and perhaps in many situations the pivots that can make a difference…this involves moving away from the workstations and view-boxes and interacting more and more with patients, other radiologists and our physician and surgeon colleagues. And apart from knowledge, this also requires us to have good communication skills, bedside manners and empathy. Today’s (April 08, 2013) issue of JAMA Internal Medicine brings forth a new controversy regarding another common and popular interventional radiology procedure – retrievable IVC filter placement. A review of data in a new retrospective study on the efficacy of IVC filters, has shown that there is only one randomized control trial published in 1998 that showed a reduction in the rate of symptomatic pulmonary embolism in those with filters but with no significant long-term difference in the death rate at 8 years and with an increase in the rate of deep vein thrombosis in those who had filters. Another study in the same issue discusses the differing rates of use of this technique in California, the main factor being the particular hospital that is providing care. The Society of Interventional Radiology guidelines  for the use of an IVC filter list four absolute indications – “recurrent VTE (acute or chronic) despite adequate anticoagulation, contraindication to anticoagulation, complication of anticoagulation, inability to achieve/maintain therapeutic anticoagulation”. However there is a long list of relative indications with little consensus and that is where there is significant variability, depending on the aggressiveness of the program. It happened with vertebroplasty when two studies by Kallmes et al and Buchbinder et al, comparing sham procedures with actual procedures showed no significant difference in pain scores between the two groups at all time points. This kicked up a huge storm in the interventional radiology and spine communities, but also forced us to examine our data more objectively and spurred more hospitals and groups to perform their own double-blind control studies, a few of which like the Vertos II trial, have shown that vertebroplasty is better than controlled medical treatment, though there has been no comparison with sham procedures since the 2009 studies. 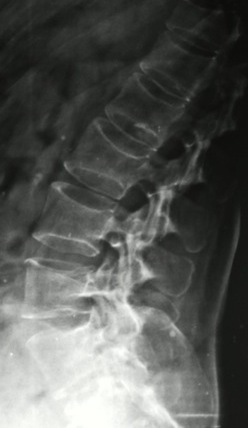 We all want to believe that “doing” something that is intuitive (cement in an acute fracture, IVC filter stopping downstream emboli) has to help, just like Dr. Zamboni’s belief in treating patients with multiple sclerosis by dilating areas of venous narrowing because of the theory he ascribes to that chronic cerebrospinal venous insufficiency is the cause of multiple sclerosis. Procedures sometimes quickly become mainstream without data, simply because “they make sense”. Cardiac CT angiography found adopters in patients and celebrities like Oprah Winfrey, simply because it made sense to see the coronary arteries without a catheter, despite the lack of any kind of initial data. In the end though, we as radiologists need to create compelling stories for the use of techniques, modalities and procedures by making sure that there are enough controlled studies that demonstrate efficacy and safety. Hopefully in the near to medium future, there will be more date regarding the efficacy (or not) of IVC filters that will clear the air and help patients and the treating doctors make better decisions. This story has been contributed by Dr. Argha Chatterjee, a third year PG in the department of Radiology at the Medical College and Hospital, Kolkata, after reading the earlier post on Tea and Fluorosis and in the spirit of this blog. This is the story of a 28 year old gentleman, who presented to the general medicine out-patient department (OPD) with stiffness in both knees and spine for 2 years. He could not walk and was carried to the OPD by his neighbour. His knees were fixed at flexion and he had significant kyphosis. The doctors at the medicine OPD saw his knee radiographs done elsewhere, which showed gross osteopenia and a coarse trabecular pattern. The patient was admitted and radiographs of his knees, pelvis and lumbosacral spine were performed in our department. A medicine post-graduate trainee (PGT) took away the “wet” films (it was a digital radiograph, so not really “wet”) and so it never came to us for reporting. After two days the radiographs were brought to our department by another medicine PGT. They were obviously confused because the pelvic and spine radiographs showed marked high bone density. They thought ofosteopetrosis but could not explain the osteopenia in the knees. They wanted to know what sclerosing bony dysplasia can cause both. In the meantime, the history had already taken a back seat. 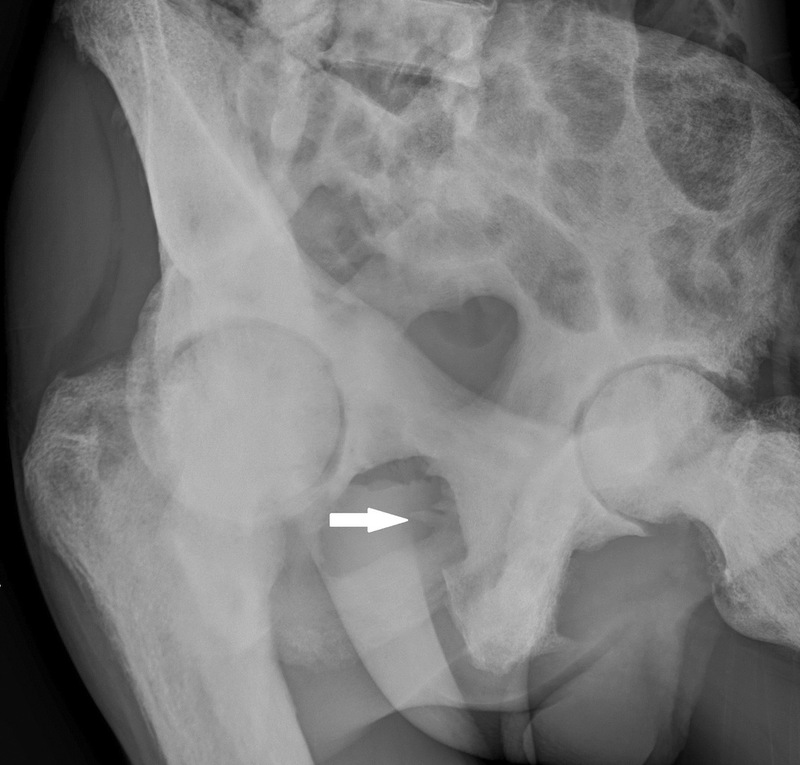 Frontal radiograph of the pelvis shows increased bone density and calcification at the ligamentous attachments (arrowheads). Frontal radiographs of both knees (fixed at flexion) show coarsening of the trabeculae and osteopenia at the lower ends of both femora. Oblique radiograph of the pelvis shows obturator membrane calcification (arrow). The PGT was not convinced. He argued for ostepetrosis. 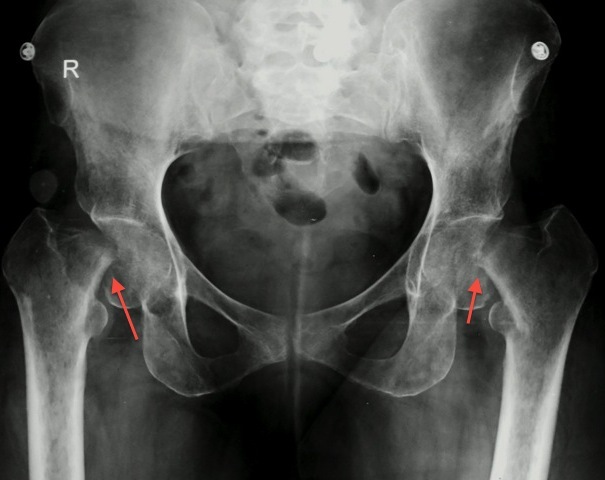 I countered that this was not dysplastic bone because the trabeculae were coarse; moreover the osteopenia and joint stiffness could not be explained by a dysplasia. He argued about the presence of coexistent osteopeia? I explained to him that osteoporosis is a known and important feature of skeletal fluorosis. In fluorosis, there is increased bone turnover. So initially there is high bone density (phase I) but later on, the long bones develop osteoporosis (phase II). He asked, “Isn’t there interosseous ligament calcification in fluorosis?” I pointed out the obturator membranes (Figure 3) and lesser trochanters. He said that his boss was not going to be convinced by just that. I agreed to arrange for a forearm radiograph free of cost. The next morning I visited the patient’s bedside after reading up the clinical features of fluorosis. The patient had every feature. The stiffness started in the spine until he was finally immobile from knee stiffness. The PGT was there with a grin on his face. He said, “This is not fluorosis. The patient has no dental changes. I checked.” I said that dental fluorosis occurs only when patient is exposed to high fluorine levels during the pre-eruptive stage of teeth. Then he dropped the bomb. “He is from Serampore, Hoogly!” Now this one floored me. The districts of West Bengal endemic for fluorosis are Purulia, Birbhum, Malda, Dinajpurs and South 24 PGs. Not Hoogly. I anyway asked for the forearm radiographs which were done later that evening. The forearm radiographs were classical for fluorosis (Figure 4). 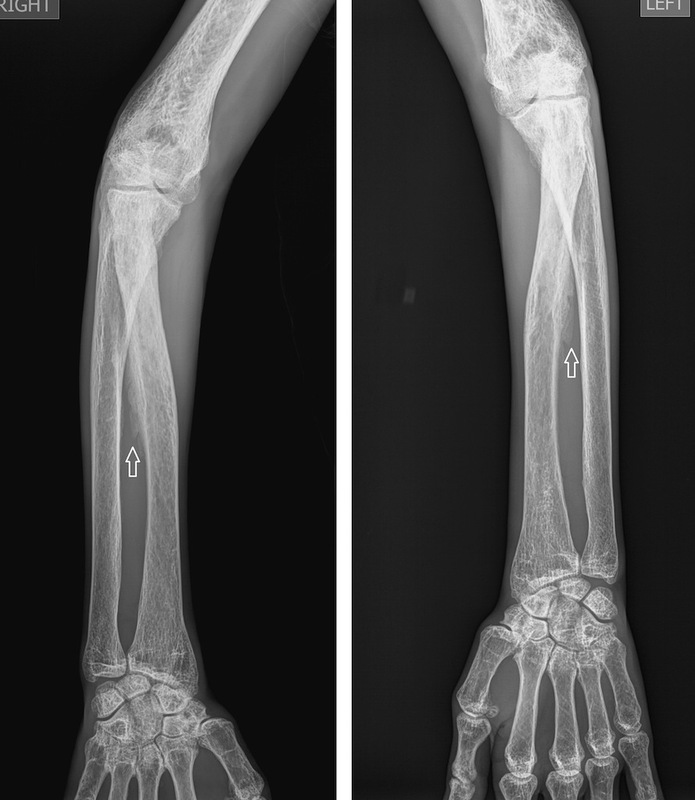 Frontal radiographs of both forearm show classic interosseous membrane calcification (arrows). Nevertheless the medicine unit did become serious about the diagnosis of fluorosis. A urine fluoride was done within the coming week but surprisingly it was normal. I thought my spot diagnosis was slipping away. About 2 weeks later, I met the same PGT in the canteen. I asked him about the case. He said a drinking water sample from the patient’s home was tested in a lab at Jadavpur University. The fluorine level was 2.5 mg/litre (WHO guideline value is less than 1.5 mg/litre). “The urine level?”, I asked. He told me that if a person is more than three weeks away from exposure, then the urine level may become normal. They finally diagnosed the case as skeletal fluorosis. He also told me that people at JU were surprised to find such high fluoride levels in Serampore. I realised that day how important radiology can be in clinical diagnosis, sometimes against other evidence and we are, indeed, clinicians, not just image readers. For a comprehensive review of the radiology of skeletal fluorosis, please read this article. I received a call about 4 months ago from a family physician, who wanted me to perform a USG or CT guided biopsy for a mass in the anterior compartment of the right thigh in a 47-years old woman. He did not give me any more details and said the patient would get in touch with me. I forgot about this, until a month later, when I was going through some histopathology reports of biopsies done by my ultrasonologist and chanced upon a report that described a hemangiopericytoma in the thigh with a comment saying that this was consistent with a phospaturic mesenchymal tumor. I called for more details and then realized that this was the same patient that the family physician, a month ago, had called about. Different people in our department do ultrasound and CT-guided biopsies and the patient went straight to the ultrasonologist, who in turn, went ahead and performed a core biopsy of the mass in the anterior compartment of the thigh (Fig. 1). A phosphaturic mesenchymal tumor is a rare condition and typically secretes FGF-23 (fibroblastic growth factor) that produces osteomalacia. This combination is called oncogenic osteomalacia or tumor-induced osteomalacia (TIO). I then asked the patient to get all the reports and details. Fig. 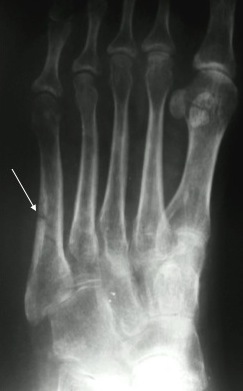 2: Radiograph shows an insufficiency fracture (arrow) of the base of the proximal right 3rd metatarsal bone. Fig. 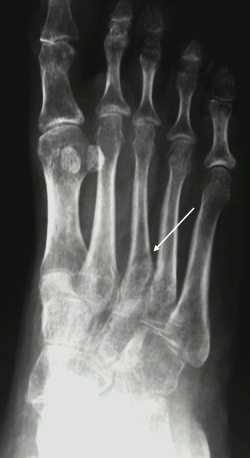 3: Radiograph shows an insufficiency fracture (arrow) of the mid-left 5th metatarsal bone. It had taken 5 years to get to this diagnosis. She started with an insufficiency fracture, five years ago, in the right 3rd metatarsal bone (Fig. 2), followed a month later by another fracture in the left 5th metatarsal bone (Fig. 3). 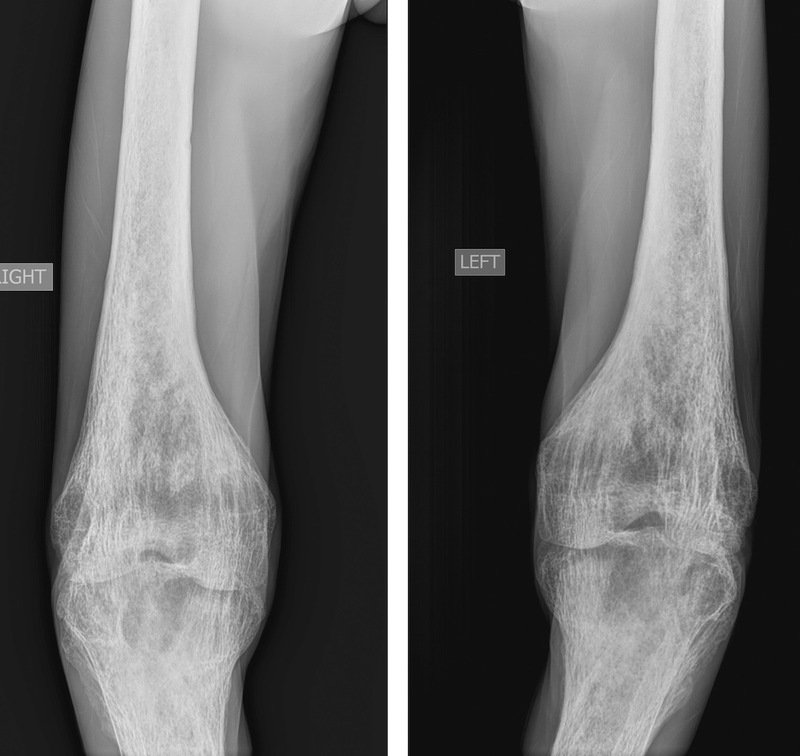 She received symptomatic treatment and went from doctor to doctor with variable diagnoses of osteoporosis and perhaps osteomalacia. This went on for 4 years, until one day, she was unable to get up from bed. She was admitted to a hospital and a skeletal survey showed fractures of the necks of both humeri (Fig. 5) and femurs (Fig. 6) with biconcave vertebrae (Fig. 7). Finally she received a diagnosis of osteomalacia and was worked up. Her serum calcium was normal, vitamin D was normal, serum phosphorus was very low and her 24-hours urine phosphorus was elevated with a normal serum parathormone level and a raised serum alkaline phosphatase level. She did not fit into vitamin D related causes or phosphate deficiency conditions and what was left was a potential diagnosis of oncogenic osteomalacia. Fig. 5: Radiograph of the bones of the pelvis and both hips show fractures (red arrows) of the necks of both femurs. Thus started the search for an FGF-secreting tumor that produces phosphaturia, hypophosphatemia and osteomalacia. A PET/CT then showed a mass with low FDG uptake in the anterior compartment of the thigh (Fig. 7), which was then biopsied. The common tumors that produce FGF are hemangiopericytoma, hemangioma, giant cell tumor and non-ossifying fibroma. Fig. 7: Contrast enhanced CT scan shows a hypervascular lesion (arrow) in the anterior compartment of right thigh, with mild FDG uptake (arrow) on the PET study. She was operated and the tumor removed. Most patients show dramatic recovery of their phosphorus levels, but the skeletal changes and fractures take time to heal. The patient is slowly getting better symptomatically. The most common reason for delayed diagnosis (in her case 5 years with an average time of 4.7 years from start of symptoms to final diagnosis) is due to lack of awareness and the inability to find the tumor. This case was recently presented by our DNB resident Dr. Parang Sanghavi in the Teaching Files Case Presentation meeting in Mumbai, where it won the first prize in the 3rd year residents’ category.